The main objective of this research area is the development of a system that automates the construction process. The system seamlessly integrates architectural design, planning and simulation tools. The automation in the construction industry is less developed when compared to other industries. Traditional methods on house-building are usually based on manual techniques which are slow and expensive. The productivity of construction industries can be improved by using new materials, new construction methods and new information technology techniques. The aim is not only to increase productivity, but also to improve work safety and hygiene conditions. These systems will increase the quality and the customer satisfaction. The main difficulties that focus the automation construction industry are: non-structured workspace, the building diversity, the number and variety of construction processes, the volume and weight of pieces to handle, the necessity of qualified workers and the exchange of information between the different stages (design, planning, transport, erection, maintenance, etc.). The integration of activities should be the major objective to increase benefits. This work is part of an integrated project that deals with automation in the construction and, in particular, with the erection of modular buildings. The buildings will be assembled by placing prefabricated modules with robots or automated cranes. A Computer Integrated Construction (CIC) architecture has been proposed to achieve modular construction. 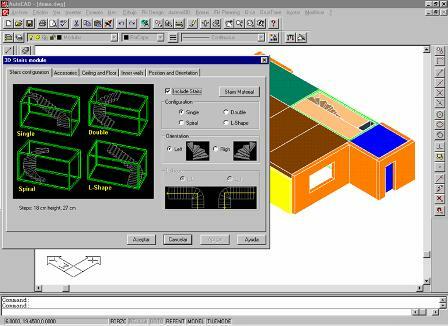 Design, planning and simulation tools have been integrated under a common graphical user interface. In this work, several design and animation tools have been developed. In parallel a planning tool has been developed to calculate the modules assembly sequence from the design data. The first design tool guides the user step by step to place modules into design from a library of parametrised modules, created specially for this purpose. The second design tool permits to obtain in an automatic way the dimensions and position of the modules that are needed to construct a building starting from the traditional architectural design. The selection of the modules will be carried out responding to several criteria: minimum number of modules, minimum number of different modules, module size and shape limitations, etc. Simulation and animation tools have also been designed and implemented within the design CAD itself, as part of this thesis. These tools consist of, a gantry crane simulator, a tower crane simulator and a program editor for both. The simulators can be moved manually or can be programmed to execute the task written in a specific crane language which has been developed. This language is used to program the real prototype of gantry crane in the laboratory. Programs can be written with the program editor or automatically generated by a planning tool.